My Mamboni says that people just don't make real, bonafide pound cake often enough anymore. I think she has taken it upon herself to make up for that lack of pound cake because it's a treat she makes often (and quite well, if I do say so myself). Delicious. However, if push comes to shove, I must say that I still prefer apple pie. Preheat oven to 300F. Butter and flour two 9x5-inch loaf pans, a tube pan, or a Bundt pan. In a medium bowl, sift together the flour, baking powder, and salt; set aside. In a large bowl, cream the butter, shortening, and sugar until light and fluffy. Add the eggs and beat well. Add the flour mixture, alternating with the milk. Stir in the lemon extract. Pour the batter into the prepared pan(s) and bake 1 hour for the loaves or 75 minutes for the cakes, or until a toothpick inserted into the middle comes out clean. Let the cake(s) cool in the pan(s). Since this recipe has been used by my Mamtucket for many, many moons, I'm honored to use it as my contribution to Giz and Psychgrad of Equal Opportunity Kitchen for their Tried, Tested, and True 3: Wedding Edition event. Psychgrad's gettin' hitched and needs some good recipes for her reception. Although pound cake isn't really a traditional wedding food, it holds up well and can easily be dressed up to make a delightfully elegant dessert. Good luck with the planning, ladies! Wow...it looks so moist and fluffy! I want a slice with some ice-cream please! I think pound cake is a great contribution... after all, how can you have just one dessert at a wedding. And yours looks delicious and moist! And pound cake, you are right not to many people it anymore. I just love it. With my calorie budget, I think I could manage a one inch square piece of it. It's beautiful and a great contribution. I'm printing out the recipe as we speak and plan to add it to the family meet n'greet buffet. It's perfect!! Lemon extract sounds like a delightful addition! I'll take mine with a cup of tea please. Looks wonderful and so moist! Mmmm, I have looking for a Moist pound cake recipe! I can't wait to try it, thanks so much for sharing it!!!! It's all about the glaze. 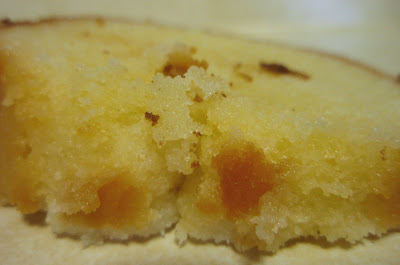 I love a good pound cake that has been around a few days and gets all moist and yummy. I'm having my morning coffee and would enjoy this cake so much. I love pound cake. This looks great and I agree that no one makes pound cake anymore but they really should. I love pound cake, and your version is my preference. Yum!! My mom makes old-fashioned poundcake - plain, no lemon, almond, etc. - and it's so. good. It was my grandmother's recipe, too, by my mom knows it by heart. I'm afraid of getting a lazy streak and haven't tried it. I love real old fashioned pound cake. Still warm from the oven...I'm drooling now;) Yours looks so good and moist! I'll have to give it a try! I love pound cake , it's one of those cakes that you can do so many things with and it's great everytime. Grace you put a smile on my face everytime i read all the wonderful names you have for your mom! Sorry Grace...this beats apple pie for me. It looks mouth watering good. I'll have to agree with your Mamboni :D but for some of us the reason might be that we were forced to eat dry pound cakes during childhood just so we don't upset grandma ;). I tell you if it were so moist I would have asked for it every day! We must be long lost sisters because I have a great fondness for pound cake. Of course, I'm always torn between the addition of lemon extract or almond extract. My husband would tell you that the best part of a pound cake is the batter...you know, licking the bowl or just eating the batter. You can't go wrong with pound cake, yours looks especially delicious! You should enter a apple pie in pie week!!!!! Grace, this pound cake looks amazing! Wish I had a slice! Tell Mamboni I often make pound cake. I like mine plain, but my hubster and offspring always want the strawberry and cream toppings. I make mine as a loaf, not ring. Pound cake, never goes out of style...I feel the same way about both....maybe we need to come up with an apple pie pound cake? Or a pound cake with apple pie???? But I've gotta say, I'd love to try some of this with that lemony flavor! gorgeously moist looking pound cake. anything with lemon is even more lovely than without it, and so this simply might be the perfect thing to bake this weekend! I'll do my part to bake more pound cakes! The lemon cake looks perfect. Oh dear, thank you for reminding me how much I love lemon, buttery pound cake. I wish your mom would make ME some!! Oh yum. Truly evil to tempt me with such buttery goodness when I have to watch every bite I put in my mouth. No, seriously it looks very, very good!! Pounds 96 to 135 for moi! Georgeous! & of course love the butter!!! OMG....how wonderful looking. And you are correct no one makes a good old classic pound cake anymore. This looks fabulous my friend. Great Job! I love a good lemon cake, especially one as moist as this! Looks mouth-watering...mmmm. i love that you called her mamboni ;) your mom can cook for me anytime!! I will have a big slice at Psychgrad's wedding Grace. I agree, pound cakes don't get made enough. I'm guilty of letting them sit second seat for fancier looking cakes so thanks for reminding me of how good they are! I am a pound cake fiend--although because I make it often and well and because it is my mom who makes the amazing apple pie, I too would probably take apple pie. This looks scrumptious. Lemon pound cake is my favorite as well. Could I just have a huge hunk of this lemon cake AND a slice of apple pie?? This would work for our family get-together, for sure! I'm liking the topping idea too. Maybe lemon pound cake with strawberries all over? Thanks for participating in TTT3! Ohhh, see? This sounds incredible to me right now. Something rich a lemony. Excellent job, Grace. OH WOW! This pound cake looks amazing. Dense yet moist, beautifully golden. I'd like a slice right now! Go Mam! This is awesome. I want to lie and sleep with piece, like it were a fluffy pillow. I will then eat my said fluffy pillow. Pound cake will always have a special place in my heart (and my tummy). Even when served plain, it is a special dessert. I love how moist this one looks---simply delish! It does look moist & yummy! WOW that looks great! I love pound cake--love it. You've got me ready to lick the computer screen. Really. 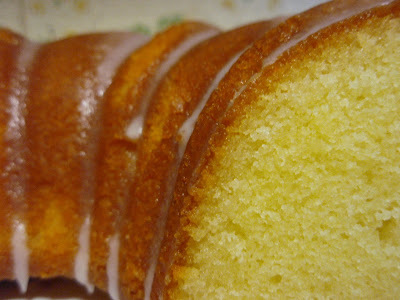 I love lemon pound cake and yours looks amazing!So moist- I can almost taste it now! Grace- This looks heavenly. I could just dive right in!! That lemon pound cake looks really good! I truly believe pound cake is from the Gods. This looks perfect! Oh I'd have this over apple Pie any day, looks wonderfully lemony! Looks moist and yummy. And the lemon? Oh yah. Kind of like those pudding cakes. Sounds heavenly. Taste buds are all whacked out now. Arg. Grace, I have to agree. I think many people feel that pound cake is old fashion, but they forget just how good a beautiful pound cake can taste! Why does a piece of pound cake turn into a piece of 5 pound cake when it hits my thighs? Mmmmmm, I haven't made a pound cake in years, I think I may just have to now! Apple Pie is good but as cakes go, Pound Cake is a winner! I made an eggnog pound cake over Christmas and we really enjoyed it. Lemon might be even lovelier, especially for a sunny spring day. yummy!! this pound cake looks so moist and good! I'll have to make some soon! lemon pound cake is my fav kind of pound cake. i know this is bad, but i love the stuff at starbucks! Lemons were on sale this week at my supermarket and of course, I stocked up. Seems there is lemon something everywhere! This cake looks FABULOUS. how gorgeous! i've been really craving lemon chiffon cake recently; everything in the blogosphere is so lemony!